This is it! The final day of the final week of AWESOME-tober-fest 2015. It’s been a blast. I really hope you guys have had as much fun as I’ve had. I’m sad to see the Halloween season come to a close. But, all good things, am I right? Anyway, without further ado, here is today’s final AWESOME-tober-fest article and it’s the last of this week’s look back at all of my previous years’ AWESOME-tober-fest subjects. Last year, my theme was Bloody Best of Fangoria. I went through the vast history of the magazine, showed you articles and pictures and each Friday I reviewed a B-horror movie that appeared in the pages of the magazine. Those reviews were called Fangoria Movie Fridays. 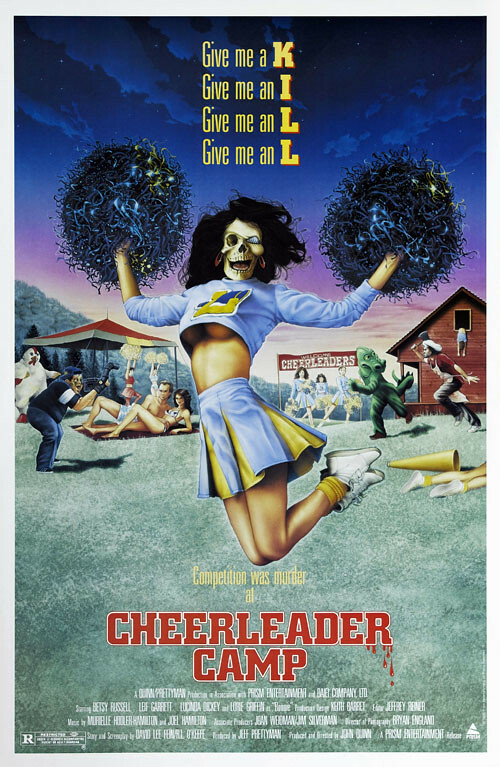 The last FMF was the awesome Cheerleader Camp starring Lucinda Dickey. But it was almost a different movie. As a matter of fact, it was so almost a different movie that I had watched and mostly drafted a completely different movie review but I changed my mind at the last second. I think it’s time to bring that movie back and give it its due. That movie was the flick Destroyer from 1988. It starred Lyle Alzado, Debra Foreman and Anthony Perkins. Here’s the ad they used to promote the VHS release. I remember seeing it in an issue of Fangoria. Lyle looks like he’s holding his head weird. Or is his head just Photoshopped into the poster? I can’t tell. Here’s the actual poster for the movie. Yeah, this is actually a bit more bonkers and awesome. Did you notice that they added a LASER SCOPE to the jackhammer? Why the f**k does he need a laser scope on the jackhammer?! Crazy. And weird. And awesome. Anyway, this movie poster obviously spoke to me. Lyle Alzado as a “half dead” serial killer? Anthony Perkins as a horror movie director? Yes, please. So, first, is this movie any good. Ehhh, it’s okay. It’s not bad for a late 80s slasher flick with a ton of cult pop culture familiar faces in it. What’s it about, well, Alzado plays a serial killer who is on Death Row. He is about to be executed when a power surge while he’s in the electric chair makes him “half dead”. Essentially it makes him a savage, nearly indestructible killing machine. The jail is abandoned and Lyle is left to roam the empty jail. Flash forward two years or so and a horror film crew arrives to film their movie in the infamous jail. They, of course, stir up Lyle who starts killing off members of the crew. How do you stop an unkillable monster? I. Don’t. Know. That’s the basic premise. Did I mention this movie had familiar faces? Yep, let’s quickly look at the cast. 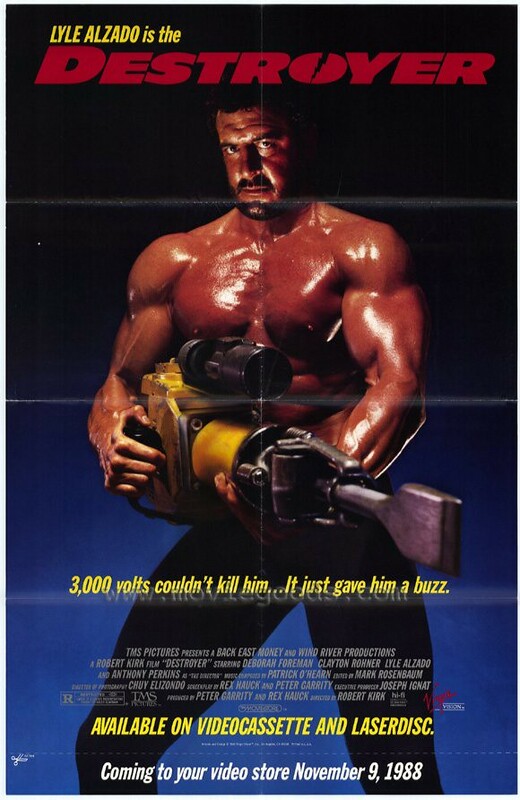 You’ve already seen sweaty Lyle Alzado up there on the poster as the “lead”. Lyle is known mainly for football but he also appeared in this movie, Ernest Goes to Camp, Zapped…Again! (yes, the sequel to Zapped!) and the sadly short lived wrestling sitcom Learning the Ropes. The next most notable face would be the aforementioned Anthony Perkins, best known as Norman Bates in the Psycho movies. Anthony is playing the director of the horror movie-within-the-movie, Death House Dolls. Honestly, Perkins is pretty much the best thing in the movie. He’s very entertaining and I loved every scene he’s in. Here’s a familiar face, Clayton Rohner. I did not expect him to pop up in this movie. This guy is an 80s staple with lead rolls in Just One of the Guys, I, Madman and another little horror film I love called April Fool’s Day. If you haven’t seen April Fool’s Day, watch it. It’s pretty great. But also starring in April Fool’s Day was an actress named Deborah Foreman. And in a nice little reunion, Deborah is in this movie as well. Deborah is adorable. You’ve seen her in a ton of 80s flicks like Valley Girl, Real Genius, Hot Pursuit and My Chauffeur. Unfortunately she goes with “Hilary Clinton” hair in this movie which is rather…unfortunate. I do like both of these guys, so it’s nice to have them here. Clayton comes off a little better because he’s written to be a funny, irreverant writer so he has some funny lines. So, how’s Lyle? He’s okay. I mentioned his character is described as “half dead”, which I assume means he has “crazy eyes”. Because that’s what he does at every opportunity. Gives us his “crazy eyes”. He does seem to have a lot of fun with that jackhammer, though. Easy, Lyle, you can go blind handling that jackhammer so much. Take a break, buddy. If you like cheesy 80s “horror” with a dash of comedy, I think you’ll like this.